decide which ones to choose! There are no rules for journaling, it is 'anything goes'. This is actually the oft-quoted "The journey is the reward"
With journaling very different forms of expression can be used: painting, drawing, photography, collage, stamps, stencils, chipboards, writing, .... and much more. 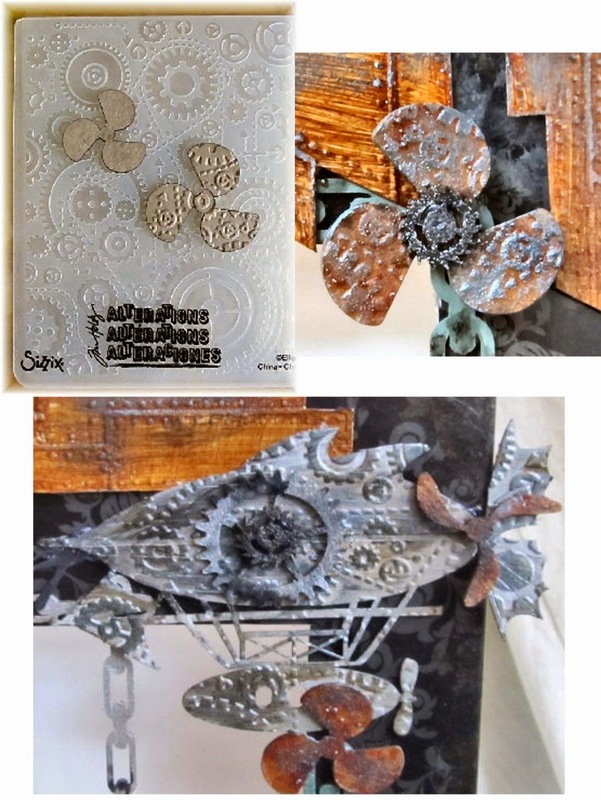 Often it is a combination of different techniques in Mixed media style, that lead to pages. I look forward to seeing you all play along this month in Laurie's Color Your World Challenge. Click here to find out the full details from your host the wonderful Laurie. 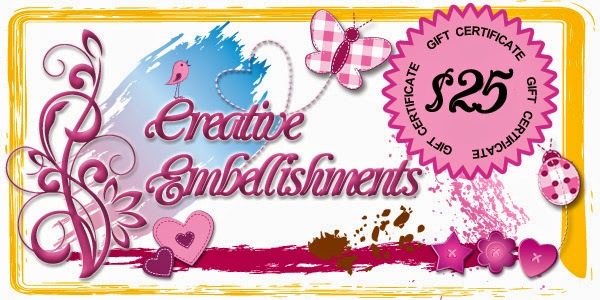 You could even win a $25 voucher prize from this month's sponsor Creative Embellishments! Looking forward to seeing you here at Our Creative Corner again soon! This month we are shining the spotlight on the winner of the Tic Tac Toe Challenge that was hosted back in February by Julia! Julia selected Branka as her winner and we are thrilled to be welcoming her as this months Top Talent!!! 2. What if anything, do you consistently draw inspiration from? I draw my inspiration from different sources. 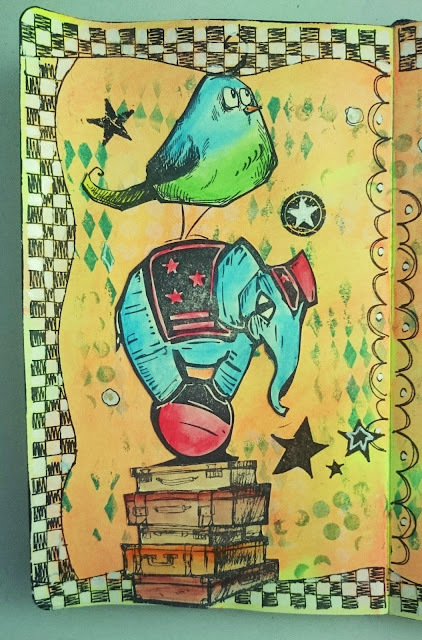 It can be anything - sometimes it's a nice quote, sometimes It's just a new stamp or embellishment...I can draw my inspiration from Pinterest and from the outstanding designers such as Tim Holtz, Dyan Reaveley, Dina Wakley and many others. 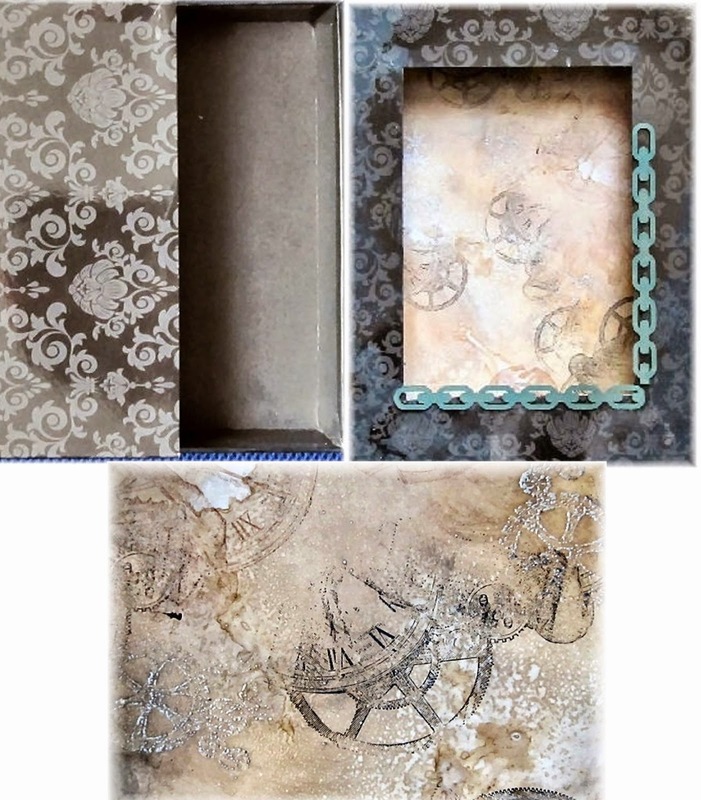 If I could only use three craft supplies for the rest of my life (oh, no, that would be a disaster), they would be an art journal, some spray paints and a white gel pen. 4. What other hobbies or talents do you have that you'd like to share with us? When I have an inspiration (and time) I like to write poems and short stories and I love to spend my time in reading the books. 5. What is the most useless item that you have purchased for your craft? Fortunately, I have never purchased any useless item for my craft. I am buying a lot of craft supplies but I always have an idea what I really need when I am making my shopping list. 6. What one thing have you not done that you really want to do? One of the things on my wish list is a traveling to Japan. I would like to visit that amazing country as I can speak Japanese and would love to practice the language there. 7. If you had a warning label, what would yours say? If I had a warning label, mine would say: Allow 5 minutes to cope with life after waking! ....So now it is time to shine the spotlight on the Top Talent creation - let's see what Branka made for us! This is fantastic Branka! - So wonderful - such amazing vivid colours! It really has been such an honour to feature this wonderful creation at Our Creative Corner. 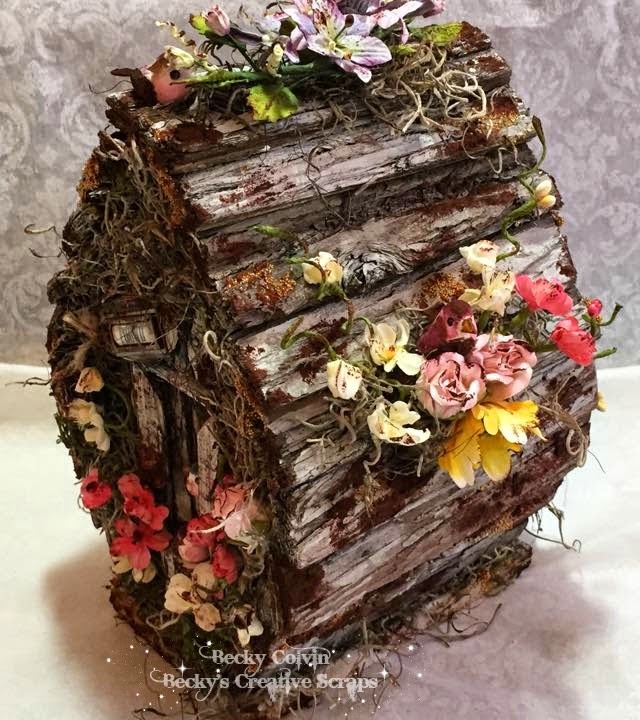 If you want to see more photos and details of this wonderful creation and find out how it was made, then please go along to Branka's blog and say "Hello" - I am sure she would love to see you there! 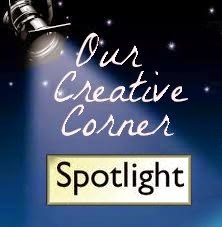 Welcome to the first of this month's Sponsor Spotlights! Hello dear crafters, Kerstin here and I am so pleased to bring you the first Sponsor Spotlight of April! 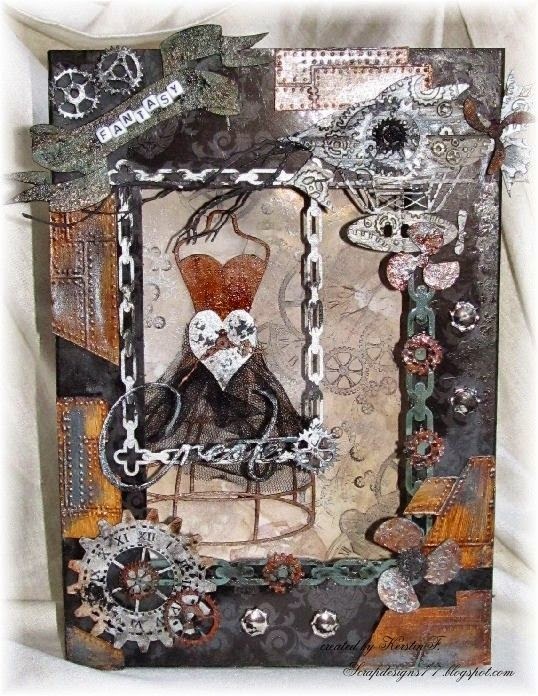 I adore Creative Embellishments because they fit into creative work in so many ways. 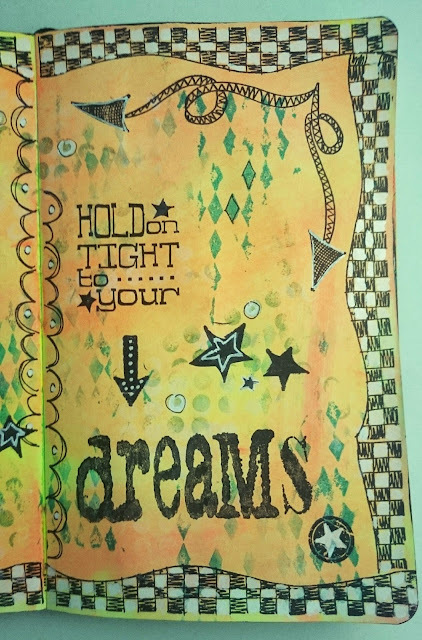 You can work with colors, structures and effects, but also stamping, or work with embossing powder or embossing folders. The chipboards give the project the special touch with a great 3D effect. They are wonderful craft items to work with! Inventive genius and adventurous romance are what makes Steampunk so very special and exciting to me. I hope you will be inspired by this paradox and magical world too! I started with a gift box from which I cut out a window. The Chipboards are made of sturdy cardboard, which is ideally suited for embossing. It creates interesting structures, which can be emphasized with metallic effects. The other embellishments were decorated with different acrylic colors, mainly silver, rust, patina green tone and black, to give the creation the appearance of something old, rusted and weathered. There are so many things you can do with embellishments. What will you do with them? Come back on the 25th to see some more Creative Embellishments! This incredibly talented lady has a style I truly admire. She can go from a lovely shabby-chic to vintage yumminess. She always puts her heart into what she makes. Her projects will inspire you and her sweet personality will bring a smile to your face. I am very excited and honored to be invited here as a Guest Designer by Laurie for her very first challenge of Color Your World. 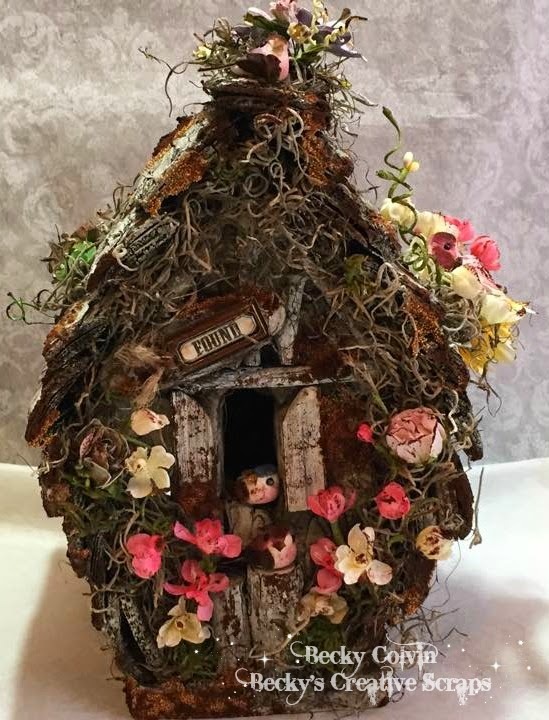 When I was first asked to be a Guest Designer I immediately thought of this birdhouse that I picked up at a thrift store. It looks old and rusty and is just waiting for spring to hit it and that's just what I did! 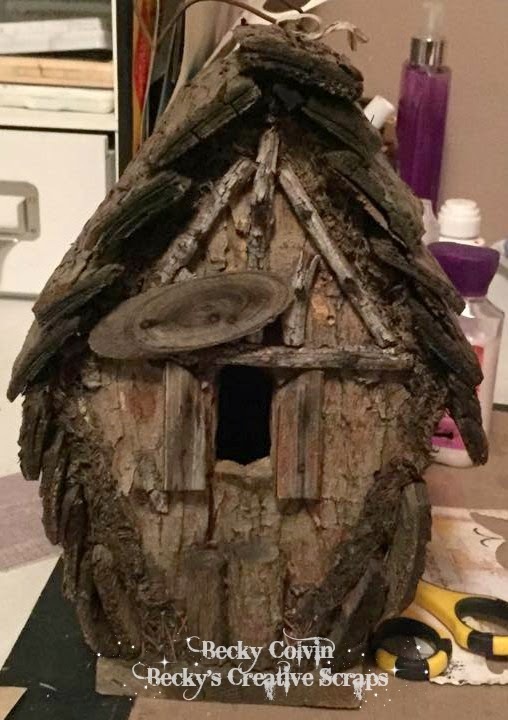 I white-washed the birdhouse with some gesso mixed with water. After that was dry I then applied some Art Ingredients Micro Beads mixed with Art Ingredients 3D Gloss Gel and some Viva Decor Rusty Paper mixed with sand to give it that rustic look. You can get all these products at Laurie's store Moore Art From the Heart. I am absolutely in love with the Rusty Paper; you should go pick up some and try it for yourself! I also used some Spanish Moss under the Wild Orchid Craft flowers and Prima Flower Vines. 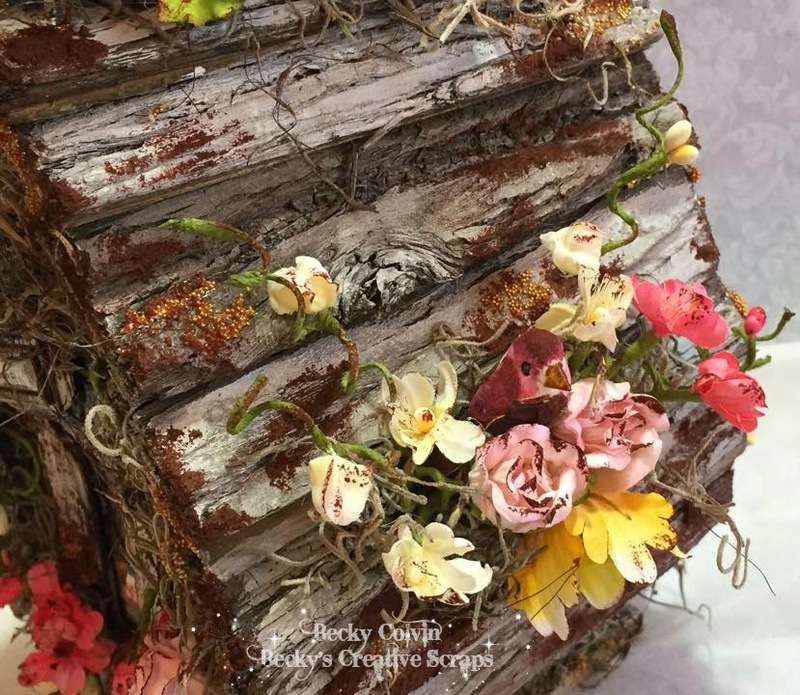 The flowers mixed with the rustic colors reminds me of what it looks like in my area when Spring starts to come alive. The dark and dreary from the winter months mixed with the fresh pink and purple spring flowers. The fresh air...look even the little birdies that I got from Kraft Supplies 4 U are even coming out to enjoy the colors of spring time..lol! 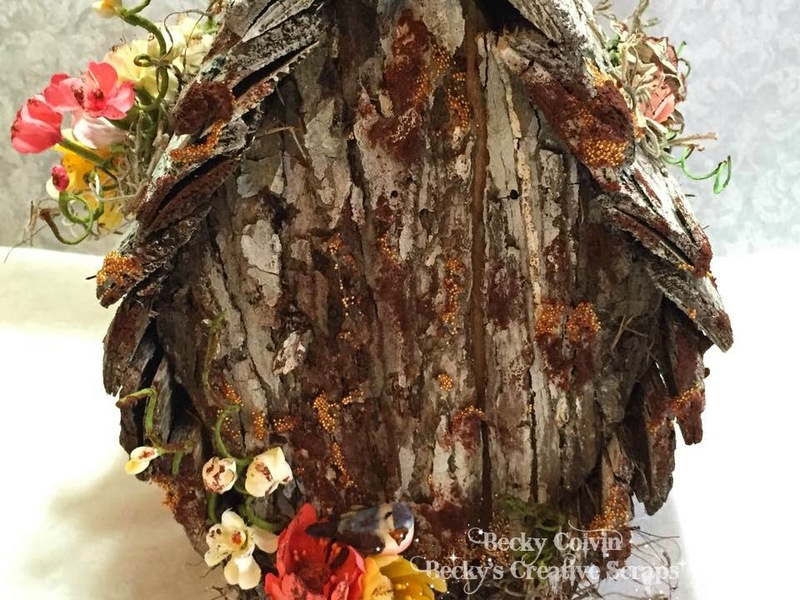 Thanks so much Becky for being our Guest Designer this month! 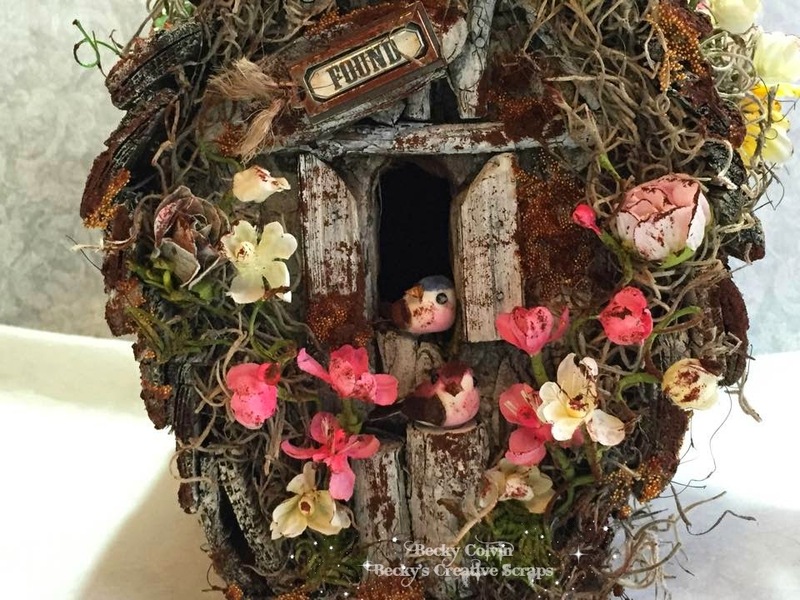 That is an amazing birdhouse - What an absolutely wonderful spring creation to share with everyone today! Has Becky inspired you to create with the colours of spring? If so, you have until the 28th April to join in the challenge - You could be our winner and appear at OCC as our Top Talent. 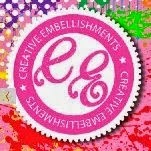 You could be our randomly picked winner and receive a $25 voucher to spend at Creative Embellishment! You could also be one of the Top 3 and be put on our Pinterest board for all to see! Having been struggling with a severe creative bloc for almost two weeks now (which feels even more stressful when you know you're being counted on as a RGD ;) I decided to find and try out a way to help jump that hurdle more effortlessly than by endlessly wracking one's brain and getting more and more frustrated (which doesn't help at all...on the contrary!). I remembered that I had read about creativity prompt cards somewhere - which aren't a bad idea at all...but I wanted something that felt more playful and spontaneous. I love playing boardgames and rolling the dice....so I decided to use dice instead. There are not only six sided ones but also ten-, twelve- or twenty-sided dice to choose from. 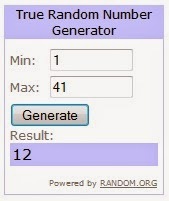 So how about advising each number on a die a certain technique or medium from the wide range of mixed media and having the die choose for me? I made a list of materials and techniques I love to use on my projects, but also made sure I included two to three techniques that I usually try to dodge (like using my own handwriting or turning to the colour wheel for reference) so there would still be the option for a challenge. And I thought it was important to have one "free choice" number - just in case inspiration might hit during the dice-rolling process. I wasn't able to figure more than ten (due to the creative bloc I am afraid) and also thought that twenty options might be a bit overwhelming - so I decided to use a ten-sided die this time. For starters I rolled a 4.....erm, well, the colour wheel it was (and for me a true challenge therefore). So I chose a base colour and the matching triad complementary colours and put them on my desk. Then I rolled an 8 (fabric), a 2 (doodle) and a 1 (stencil). So I browsed my stash for some ribbon and fabric, a black china ink marker and some stencils. 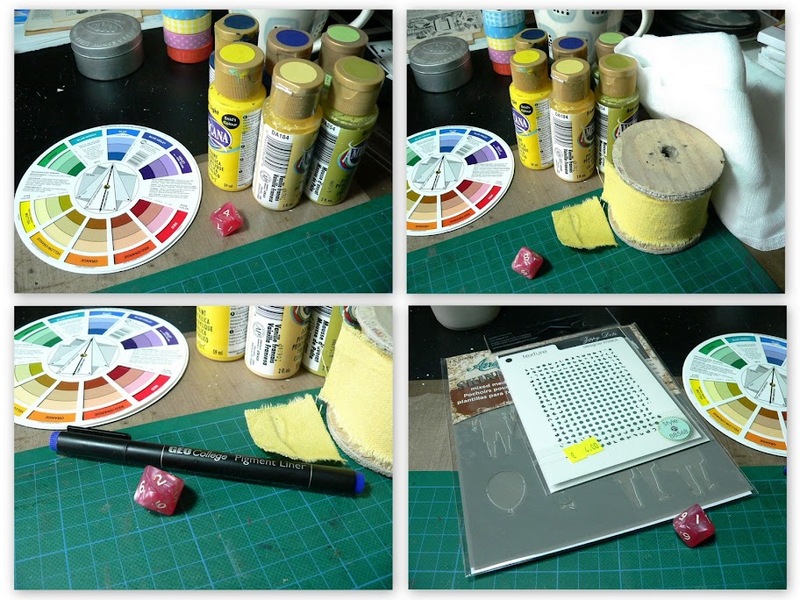 I know some prefer to immediately use item No.1 before they roll the die again (or pick the next prompt card), but I thought it might be a good idea to collect about four to six items/techniques and then stop and see if these would spark an idea for a project. My goal was to just use the dice-rolling as a little kick-start and proceed freely from the point where mojo would take over. I definitely didn't want to find myself struggling with how to put all the rolled for media and techniques into one unified looking piece (as sometimes this simply isn't possible and will have you end up with a piece that looks as if you had decided to wear several complete outfits from your wardrobe at once). As I had bought the fab Dylusions journal by Dyan Reavely aaaaages ago (without daring to work in it) I thought this was the right time to be brave and dive right into art journaling in a book (instead of using journal cards or spiral bound art journals where you can always leave out any messed up pages without leaving any trace). I applied some paint dots from the paints I had chosen according to the colour wheel and scraped the paint onto the page using an old credit card. While doing so I found that I needed another rule added to my "creative dice-rolling game": to be able to incorporate black and white at any time (as both colours help unify the elements on a page - the stamped or doodled ones as well as the white from the page substrate). So I scraped on some Titanium White too. Then I used some black Gesso to stencil on my Andy Skinner childrens image. Uh oh! My first "accident" - the outlines of the stenciled image turned out to be heavily smudged. Luckily the stencil comes with masks too, so I used the mask and a white pencil to draw the outlines to get a crisp image. Phew! Next I applied some white paint through a small dots stencil. By now two of my four rolled for techniques had already been used. The "fabric 8" gave me a hard time, but I finally decided to add a piece of rough ribbon as a kind of page tab for starters. After I had glued it on (with matte Decou-Page) I spontaneously decided my kids needed crowns. So I collaged some dictionary page crowns to their heads too. That also made the silhouettes blend in a little more with the background. 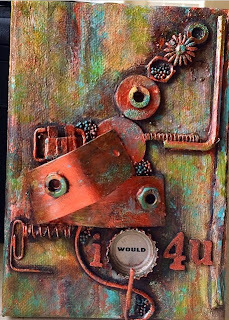 The left border of the page was stamped with a grungy texture stamp from Deep Red and I also remembered a texture stamp (from one of the Tim Holtz Classics stamp sets) from my stash that matched the crowns design perfectly. Then I turned to No. 2 and did some doodling on the crowns and some of the stenciled on dots. During that step of doodling tiny circles around some of the white dots I spontaneously drew a rough circle on the glued on piece of fabric. I hadn't thought any further at that point but when I looked at that circle it seemed to be a perfect sun. So I glued the French word for sun to it. I also decided my children needed some ground to stand on, so I sketched one using a black Faber Castell PITT artist pen. ...and doodling with black and white and also with some of the paints from the background (using a very small fine detail brush). As you can see the sun got some beams as I felt this corner looked a bit empty or too "calm", whereas the doodling on the children's dresses had gotten too "noisy", so I painted over some of it with black Gesso. The changes may seem rather small to you, but the doodles on the girl's dress (to the left) were drawing the focus too hard towards them and the painted inner lines also split the black shape into separate sections which made the silhouette partially fall apart. ...and my tea had grown cold. Which is always a good sign as it means I had lost myself in the process of happily messing around and letting one thing lead to another. I hope you liked joining me on this creative hike today! And I hope that maybe some of you will find the dice-rolling as helpful with overcoming creative blocs as I did! I am convinced that as soon as creative work starts feeling like a struggle it isn't creative (the creative-from the heart-kind of creative) anymore and that always leads to the lack of "soul" in a piece of art which is "visible" in a way (maybe on a subconscious level). So a rather playful approach to this problem we all encounter from time to time might be a helpful solution. 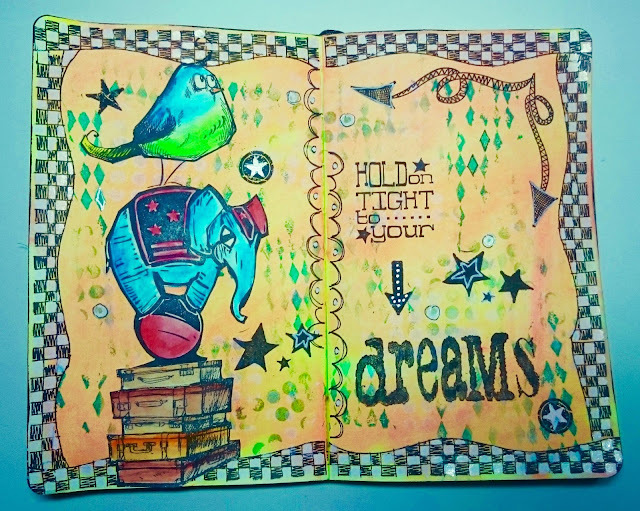 Remember to always follow your inner sun when it comes to art journaling! 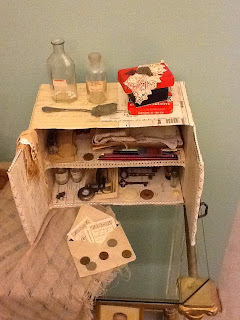 What a fabulous collection of entries we have had this last month for the Junk in Your Trunk March Challenge. I am sure you can imagine that choosing a winner and the Top 3 is quite a heartbreaking task because, as you can see from the challenge thumbnails, all the projects are so amazing. I would like to thank each of you for contributing your brilliance to the Junk in Your Trunk Challenge and adding your own lovely brand of inspiration to our crafty corner. However, according to the rules of OCC engagement, we do have to choose a winner and a Top 3 so please join me in celebrating the talented 4 who came out on top. Congratulations Samantha! You have a lovely collection of Crafty Individuals goodies coming to you! Please email OCC via the link on the sidebar and we will get the crafty parcel to you asap! This entry was just so dead on target with the theme. I loved all of it - the colour palette and the junk bits and pieces collected off of the street were brilliantly assembled into a magnificent abstract piece of pure eye-candy. If I had had a look at this in some gallery of Modern Art I would totally want to buy it! Congratulations Sarah, I loved your amazing piece. You have to go and look at all the intricate detail on these amazing Chunky ATC's. I had never even heard of chunky ATC's before this. What I found particularly remarkable was the huge stash of pretty junk she had collected and how awesomely she incorporated those random bits into something so cute! 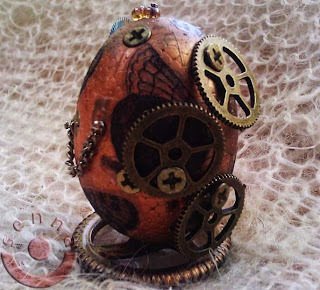 She took an old polystyrene egg shape and left-over bits of chain, star screws and odds and ends and turned out a steampunky Faberge!!! I love looking at this! Once again - Congratulations to everyone who submitted their projects for the challenge. I really did mull over who was going to be the Winner and Top 3 for many days. There were so many brilliant entries and it was so difficult to choose from all of them. Everyone did such a fantastic job. It was such a thrill for me to have hosted the Junk in your Trunk March. Click here to find out the full details from your host the wonderful Laurie. You could be our winner or Top 3 next month...You could even win a $25 voucher prize from this month's sponsor Creative Embellishments! Looking forward to seeing you at Our Creative Corner again soon.